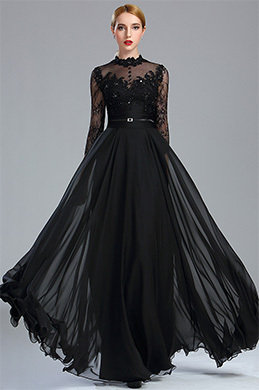 Why we all long for and love the 3/4 Sleeves black new years dresses？ For one major reason in particular is its versatility. And we all have a great affection of shift dresses for one fabulous reason: wearability. It is an essential dress in every woman's wardrobe because it is not only iconic but also versatile and timeless. Slip into the little black shift dress and those wardrobe prayers will be eventually answered from the right echo. I'm thrilled to talk 3/4 Sleeves 2019 black new years dresses (an important and essential part of our summer arsenals, of course also a must-have thing as our graduation dresses), a quality little black dress symbolizes effortless elegance, simplicity, and style. Dress your little black dress up or down using different accessories, shoes, and add-on clothing such as a denim shrug or blazer with ease and enjoy style flexibility you need in a pinch.